Now I have the great privilege of listing it here again. Due to the steel door sill plates, I believe this is a later body manufactured in 1927. The bottoms of both sides of the cowl panels appear to be rust free so I have not included photos of those areas. The sub-frame appears to be solid and in very good condition with only light surface rust in some places. The sheet metal panels on the right side are very good for a body of this vintage. The right cowl panel has no rust in it anywhere. The panel under the right door opening or sill plate has a tiny 1/16 or so diameter hole near the back that does not show in the photos. The steel right door sill appears to be fine. There is some minor rust in the panel on the right side of the seat as you can see in one of the photos of this listing. The left cowl panel has no rust in it anywhere. The panel under the left door opening or sill plate has a lot of rust as you can see in one of the photos of this listing. The steel left door sill plate has rust damage too. There is a lot of rust in the panel on the left side of the seat as you can see in one of the photos of this listing. The last photo is of a spare cowl that is included. The firewall on that cowl is in considerably better condition than the firewall on the body offered here. 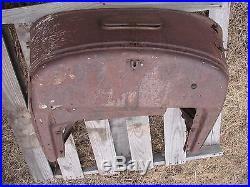 The firewalls are attached with rivets rather than spot welds as used on the later Model A Fords. Those rivets make it relatively easy to to swap out this pair of firewalls. I have a lot of friends who travel throughout the country this time of year. One of them may be able to safely and economically deliver this body to you depending on where you live and how soon you want this body. I will add more information soon. The item "A 26-27 Model T Ford Roadster & Pickup Body Coupe Touring Sedan Hot Rat Rod" is in sale since Friday, December 02, 2016. This item is in the category "eBay Motors\Parts & Accessories\Vintage Car & Truck Parts\Exterior\Other". The seller is "toysanyone" and is located in Bozeman, Montana. This item can be shipped to United States.